Located a short way north of Cernobbio - about 9 kilometres from Como in the Argegno-Menaggio direction - is the town of Moltrasio. If you're travelling by car it's worth taking the panoramic route followed by the original Strada Regina which winds its way from Moltrasio to Laglio passing through Carate Urio. To take this old route rather than a more recently built stretch of the Regina, take the first downhill turn-off to the right once you've left Villa d'Este behind you. The various parts of Moltrasio are built at different heights on Mount Bisbino as it slopes down towards the lake. Hundreds of years ago it was already famous for the stone quarried here: this local Moltrasina stone was used by the celebrated master stonemasons from Como who worked throughout Southern Europe between the 12th and 15th centuries. 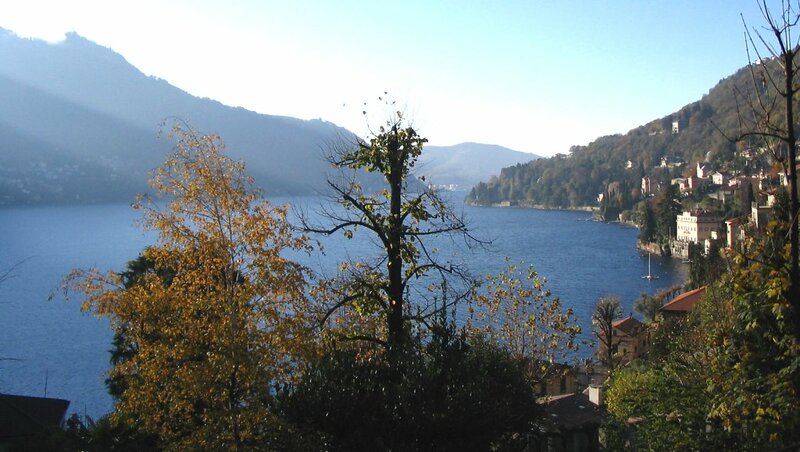 Nowadays Moltrasio is known as an elegant little town with beautiful villas stretching along the shores of the lake: one of them is Villa Passalacqua, which can be visited. Moltrasio's most illustrious former residents and visitors include Vincenzo Bellini, the famous 19th-century opera composer, best remembered for Norma , Winston Churchill who, so legend would have it, tried to retrieve his mysterious correspondence with Benito Mussolini at Villa Le Rose, and fashion designer Gianni Versace, who owned Villa Le Fontanelle.